I have included more information below our standard Weather Station display so hopefully the Weather Station page can be one of your main sources of information. A partial display (limited due to the webpage size) of RNLI Pier Weather Station. This is updated every minute. Especially when we have northerly winds this may give us a true idea of the wind offshore. If this weather station is unavailable it will revert to show the nearest which is Southend Airport. Full display can be accessed from the RNLI Southend Website under Information. Below the live information is forecast data both from the well loved Windguru and the Met Office. We’re at a position where we could do with a few hours additional labour on the Seasafe displacements & Polly to get them anti fouled ready for the new season. We have the paint already and we’ve booked the weather for both days. Now we just need some bodies to help put it on. The 2016 (and through to April 2017) duties have been allocated and are published in Dutyman today. DutyMan is emailing a list of duties to each duty-holder. Please ‘confirm’ your duties in Dutyman when you receive the email. This will let us know that you are aware of your duties. You can still swap your duty at any time even though you have confirmed it. Most have 4 support boat and/or race officer duties allocated over the year. If you expect to have duties but have not received an email list from Dutyman in the next few days then we may not have your correct email address. Please let us know on [email protected]. Suggestion: Why not sync and download the sailing programme and/or your duties to your electronic diary using the ‘Smartphone’ facility in Dutyman. Fancy a go in a Sprint15? 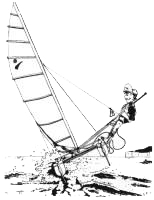 I currently have a spare Sprint15 in the dinghy park which I’d like to offer to other members who might like to have a go over the winter season. You can be assured of plenty of help from the rest of the fleet. The boat is entered for the icicle series so you can race or just go out for a sail during the racing.